Sometimes, one needs to be creative when it comes to cooking nilaga (same with sinigang, menudo and adobo) because this is a typical Filipino dish. 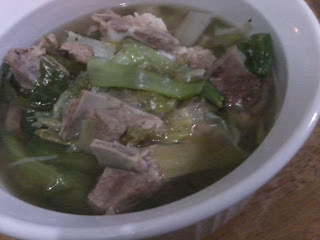 However, there is the "sawa" and "umay" factor if one will stick to the same ingredients over and over again. Boil the meat. Add the leeks after 10-15mins when the meat is almost tender. Wait for another 5 minutes before adding up peppercorns, salt and patis. Add the bokchoy when the meat is very tender and is ready to be served.